Gor Mahia conducted what could be described as the most peaceful elections as far as events of organisations under society act is concerned and sent a clear message to corporate world that it has matured enough to attract sponsorship. High School Principal Nikanor Arum trounced the incumbent Secretary-General Vincent Kodera by 446 votes to 96. Incumbent Chairman Lawyer Ambrose Rachier and Ronald Ngala were elected unopposed for a two year term in office as Chairman and Assistant Secretary-General posts respectively. Members also took the opportunity to amend the club constitution whereby office bearers will now be in the office for two years, annual subscription will be one thousand shillings while joining fee for new members will be one hundred shillings. Full list of bearers are as below; Chairman – Ambrose Rachier, Snr Vice Chairman – Colonel Owino, 1st Vice Chairman – David Kilo, 2nd Vice Chairman – Bosco Origa, Secretary-General – Nikanor Arum, Deputy – James Wamugo, Assistant – Ronald Ngala, Treasurer – Samuel Ominde, Assistant – Odhiambo Mc Owiti, Organising Secretary – Tom Ataro and Deputy – Samuel Ogola. Report by Ronald N: Ngala. Ugandan league champions URA FC will have a feel of pitch at City Stadium this evening as from 4.30pm. The contingent of 25 five officials and twenty players arrived last night in readiness for their preparatory match against Gor Mahia FC tomorrow and Kenyan league champions Sofapaka FC at the same venue the following day. Gor Mahia National Executive Committee met yesterday and ratified proposals by branches on how best to conduct the forthcoming SGM to be held on Sunday at Nairobi’s City Stadium as from 8am. Top on the agenda to be discussed and agreed upon is amendment of the current constitution to match the modern world. It was also agreed that elections of new office bearers will be done since its an agenda which was deferred by members during the last AGM. Members will pay 100/- to gain entry into the stadium while aspirants will part with 10,000/- payable to the club account in advance. Saturday 23rd 2010 at 12pm is the deadline for submission of this money.Club Chairman Ambrose Rachier, who will defend his seat, has welcomed all members. Assistant Secretary-General for Secretary General. Plans are complete to have Gor Mahia play Uganda’s league Champions Revenue Authority at City stadium this Saturday 23rd as from 4pm. URA FC contingent of 23 will arrive in Nairobi on Thursday and have chosen Gor Mahia to gauge their charges before taking on Zanaco FC of Zambia in Orange CAF champions league in Kampala Uganda three weeks later. Gor Mahia will be at full strength after the arrival of their six players who were in Yemen over the weekend doing National duty. Coach Gideon Ochieng is elated with this kind of opposition citing opportunity of building his squad mentality before playing El-Meriekh FC next weekend. El-Meriekh arrived yesterday and are camping at Kasarani. 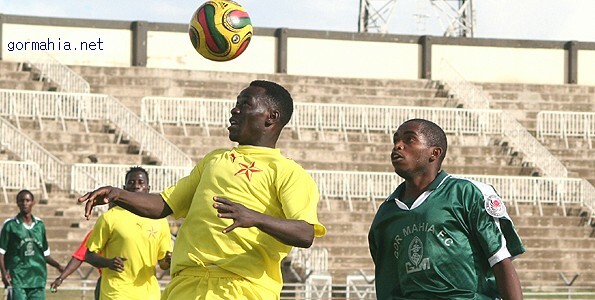 Innocent Mutiso had been playing for Mathare since his teen years. When he first joined Gor Mahia, coach Zdvarko Logarusic was far from impressed. It appeared that Mutiso would not last long at the club. But Mutiso worked his way back into Logarusic’s good graces by providing scintillating performances whenever he was given a chance. His breathtaking speed and enterprise on the wing has made him extremely useful especially as a second half substitute where he gives tiring defenders nightmares. 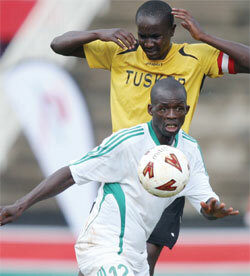 Mutiso’s career has however been marred by injuries both at Mathare United and now at Gor Mahia. Gor Mahia FC has lined up three explosive friendlies which will give the coach Gideon Ochieng an opportunity to settle on his starting eleven beginning this Saturday 16th when they take on newly promoted side Mahakama at City Stadium. This will be followed by an international friendly match against Uganda’s league champions URA FC (Uganda Revenue Authority) on Saturday 23rd at the same venue before taking on El-Mereikh on 30th January. Both URA FC and El-Meriekh will be preparing for their first encounters in Africa Champions league tournament in early February. Whereas the latter will be camping here for three weeks, the former will be in the country courtesy of Soccer International. Asst. SG- Gor Mahia FC. Gor Mahia FC Chairman Ambrose Otieno Rachier has once again honoured his words when he said after his election to the office that he will always respect the club’s constitution which states that the club’s leadership mandate will be subjected to an annual renewal. This event was supposed to have taken place in July last year but members requested the current officials to continue with their work until the end of 2009 KPL season. The current office obliged and a promise was made that it would be done before the league kicks off hence the set date. Major on the card besides elections/confirmation of new office bearers will be a chance to overhaul the current constitution to match the modern FIFA statutes which advocates for longer term for office bearers if meaningful objectives are to be met. From the office of assistant Secretary-General for Secretary-General. News that Peter Opiyo could be playing in KPL next season in Gor Mahia jersey no. 12 was received with jubilation at the same time the much sort sensational former Lang’ata high school wonder boy Kevin Omondi signed a three years deal yesterday with K’ogalo. This is good news to K’ogalo fans owing to the fact that a little known Kenyan made ‘Patrick Viera’ in the name of Teddy Antony Okumu, fished from somewhere in Mathare slums, had accepted the same deal a day before. Teddy is a midfield maestro who is bound to win the hearts of all football fans next season. Duncan Otieno Makori, scoring machine with the best scoring prowess from Migori United is another catch by Gor Mahia camp. This is one player who has amazed everybody including himself with his ability to score goals. Out of the 19 goals in seven matches scored during the Nyanza tour Makori who always came in as a substitute had five to his credit.